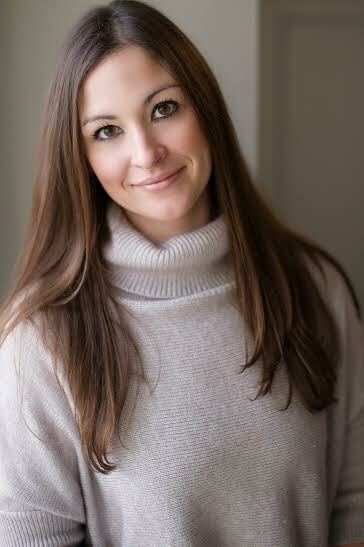 This week I am so happy to introduce you to Christine Prill, founder of Sucklebuckle™, a handy tool that makes breastfeeding a little easier for busy moms. Handy and convenient, the Sucklebuckle™ props up a nursing mama’s shirt, allowing her to more easily nurse while wearing a non-nursing top. 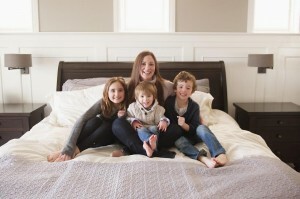 Christine is super busy with work and three kids of her own, but she is making her own business happen. What an inspiration! Homemade Mother: Welcome, Christine! Go get started, tell us a little bit about yourself. Christine Prill: I am a working mother of three living in Billings, Montana. I was born and raised in Michigan and spent most of my childhood in Grand Rapids. Although I am loving Montana, I will always be a Michigander at heart! I met my husband, Chris, while in undergrad at the University of Notre Dame, and we married relatively young right after graduation. We moved to the L.A. area where I began law school at Pepperdine and Chris worked in advertising. After a short time, we moved to Omaha, Nebraska to accommodate Chris’ change in career and attendance in dental school at Creighton University, where I also transferred to finish my law degree. While in the middle of my exams third year, we learned of our first surprise coming nine months later- and that surprise was our oldest, Anna. Consequently, I showed up to my first day to work as an attorney almost five months pregnant! Chris and I worked together the next four years juggling Anna, a demanding legal career, his onerous dental school obligations, and eventually our second child, Paxton. We moved to Montana close to 5 years ago so that Chris could work alongside his dad and brother at the family dental practice, and our third child, Quigley, arrived about 2 ½ years ago. Chris and I continue to work together in all of our parenting efforts, now managing three kids who are 8, 6, and 2, two careers, a household, and now – the Sucklebuckle™. I am so lucky to have such a wonderful and supportive family- especially Chris – he even does most of the household cleaning and all of the laundry! HM: When/Why did the idea for Sucklebuckle come to you? CP: I breastfed each of the kids for various time periods, and to be honest, it didn’t come very easily to me. A time came when I tired of wearing only nursing clothes or choosing my outfit to most easily accommodate breastfeeding accessibility. In short, I wanted a little bit of normalcy in my life. 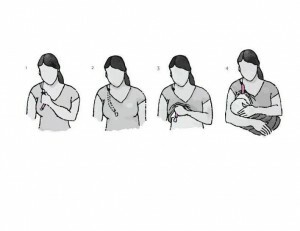 Once I began wearing traditional tops, it was always mechanically difficult to hold my shirt up while nursing. My chin was always put to use! As you can imagine, that’s not the most relaxing and enjoyable position to nurse in. I was not only frustrated while actually breastfeeding but also when pumping. After returning to work post-maternity leave and pumping multiple times a day, it was always difficult to keep my shirt out of the pump’s way. Once again, I would depend on my chin! Although the Sucklebuckle™ was originally conceptualized while nursing Anna, I allowed each nursing experience to come and go without moving forward. Once I had Quigley, I finally did it! HM: What has been the hardest part about launching this business? CP: The hardest part of launching the Sucklebuckle™ was maintaining my perseverance. Many many obstacles and challenges were thrown in my path along the way. Every step was much more involved and complicated than expected – e.g., locating a professional product designer, finalizing an exact design, finding the best materials, working through the patent process, finding a production company, the financial costs (while also saving for three college educations), etc. It would have been easy to throw in the towel. Thankfully I had so many friends and especially Chris for the necessary support, help, and advice to keep going. HM: What has been most rewarding? CP: It is so rewarding to see an idea originally formulated so abstractly in my head actually physically exist! But I’d have to say that it is most rewarding to hear from other mamas out there who are excited about the Sucklebuckle™. Helping others focus on the joys of nursing rather than some of the uncomfortable mechanics of nursing is the goal. As I said before, I struggled with breastfeeding and appreciated anything to make it a little easier. The hope is that the Sucklebuckle™ brings a little bit of a mom’s life back and ideally promotes continued breastfeeding (if breastfeeding is the right choice for her) – and how could my part in that not be rewarding? HM: If someone told you 10 years ago that you’d be designing products for nursing mamas, would you have believed it?! CP: Hah. Probably not! 10 years ago I was still a couple of years away from becoming a parent, and I therefore obviously had no experience with breastfeeding yet. While pregnant with Anna, I read in various books, parenting websites and blogs, etc. that breastfeeding can be challenging. But, I had no idea and was not prepared! I’m so thankful that I was able to get the hang of it and am appreciative of all of the helpful products that have come before the Sucklebuckle™ to help nursing moms! HM: What is some advice you’d give to a new mama struggling with breastfeeding? CP: I think every mom has to choose whether breastfeeding is the right choice for her and her child and no mom should feel guilty or pressured to make a decision one way or the other. If breastfeeding is the choice that a mom wants to commit to, seek as much help and advice from friends, lactation consultants, doctors, etc. When I was first breastfeeding Anna and although I was somewhat aware of common breastfeeding challenges, it still seemed like the other mothers I knew had such an easier time than I did. With my successive children, I became more comfortable sharing my struggles and was so thankful I finally had. Every mom’s breastfeeding experience is different and hearing other accounts and experiences was very comforting- and I even picked up a few tricks! It is great to see that breastfeeding is becoming a more open and comfortable topic. We all need to help each other out and realize one helpful conversation can make a vast difference to another. HM: What is some advice you’d give to a fellow mama who wants to launch a business? CP: Wow. There is so much to say! My number one piece of advice would be to have faith in yourself. If you are a mom, you are used to hard work – so you can do it! But make sure to do it right. Take the time and effort to perform the necessary preliminary research and development; attend to legalities; project realistic budget estimates; seek out other business owners for advice; communicate with your family to make sure everyone is supportive and on the same page; make as many useful connections as possible – and use those connections – it never hurts to ask! Finally, hug those kids – they’ll always put a smile on your face and relieve some of the stress. But maybe you also want to grab a glass of wine at the end of the day! HM: Can you share a favorite family recipe? CP: I don’t know if this is considered a family recipe, but my kids LOVE these Cake Batter Crispy Treats. It’s simple enough for the kids to help make – and they sure love to eat them! 1 (1.75 oz) container of sprinkles – or more if you love sprinkles like we do! Melt butter in a saucepan over low heat and add marshmallows. Stir until they begin to melt, then remove from heat. Add the cake mix, then the cereal and half of the sprinkles. Press the mixture into a baking dish and top.